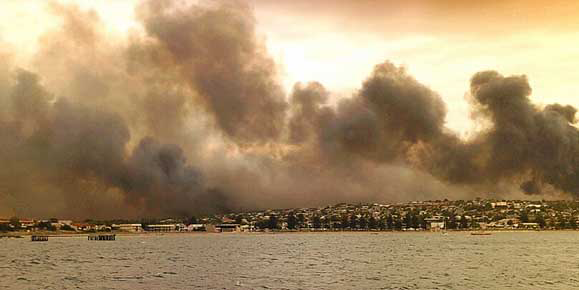 “The city is on fire! A wall of flame has swept through the marketplace, killing hundreds of citizens. Guardsmen are shooting women and children who are trying to force their way onto ships at the docks. And the xenos … they’re in the city and … and … they’re eating people! They’re eating people while they’re still alive!”—Unauthorized vox-cast from Malati, just before the city fell to the Tau, 3 945 735.M41. IMPERIAL NEWS REPORT, 3 946.735.M41–The port city of Malati fell to xeno forces yesterday despite a heroic defense by the 23rd Dar Sai PDF and elements of the 728 Cadian Regiment. While bloodied, both regiments managed to evacuate the city, although significant quantities of military equipment and vehicles were destroyed so they would not fall into the hands of the enemy. Click on all photos for larger view. For more than half a year, the port city of Malati had been under siege. But, with the majority of Imperial forces battling orks on Hegira, and the Tau supply lines shattered by the space battle won by Commodore Hennard, neither combatant had the necessary troops to force a decision. But neither side had been idle. On the city’s outskirts, hastily built barricades slowly gave way to fortifications and trench lines, the result of mobilizing thousands of civilian laborers. The Tau, meanwhile, had secretly consolidated their meager military assets across the planet. The xenos also carefully analyzed the Imperial defenses. Aerial drones flew over the trench line every day, and although many were shot down, the data they collected was critical to the Tau’s plan of attack. On the far western flank, the Tau realized, the Imperial defenses were not complete. There were gaps in the trench line where excavation had not yet begun, and xeno snipers had prevented laborers from cutting back the tree line to create a killing zone. Here was a weak point in the defenses—and if the Tau struck swiftly, with overwhelming strength, they could flank the Imperial defenses and break through to the city beyond. On the morning of 3 945 735.M41, the Tau did just that. El’Tash’var Jax’nesh, commander of all Tau forces on Dar Sai. Also known by the honorific title: Commander Swiftstrike. Took personal command of the Crisis Suit strikeforce that made an aerial assault on the Imperial right flank. Capt. Stevrous Stark, commander of all Imperial forces on Dar Sai. Also known as the Hero of Dar Sai. Oversaw operations from a fortified HQ position that, late in the battle, was struck by xeno artillery fire. Despite xeno attempts to conceal their buildup of troops, Imperial intelligence was aware of the concentration in Tau military forces, and Capt. Stevrous Stark responded by shifting reserves to the anticipated point of attack. The line of PDF troops was reinforced with a company of veteran troops from the 728th Cadian Regiment, as well as with contingents of Sentinels and tanks. The 14th Mechanized Co. also was mobilized to provide a mobile element to the defense. At the same time, a detachment of Skitarri, a security detachment from the manufactorum of the city, was provided by the Adeptus Mechanicus and quickly deployed in a gap in the Imperial trench line. Finally, a detachment of Ratlings infiltrated the woods between the two forces. Recognizing that the xenos might use their superior technology to begin the battle in the early morning darkness, most Imperial soldiers were ordered to sleep in the trenches, fully equipped, and they were roused at 03:00 in anticipation of an early attack. The men ate a hasty meal in the darkness, and they were just assuming their posts when an officer’s whistle pierced the air. This was soon followed by the sound of whistles up and down the trench line—a shrill warning of approaching enemy troops. On the Tau side, there was no sleep for the warriors. Troops attempted to move as quietly as possible to their start-off positions, while skimmers moved slowly to keep down the volume of their spinning turbines. 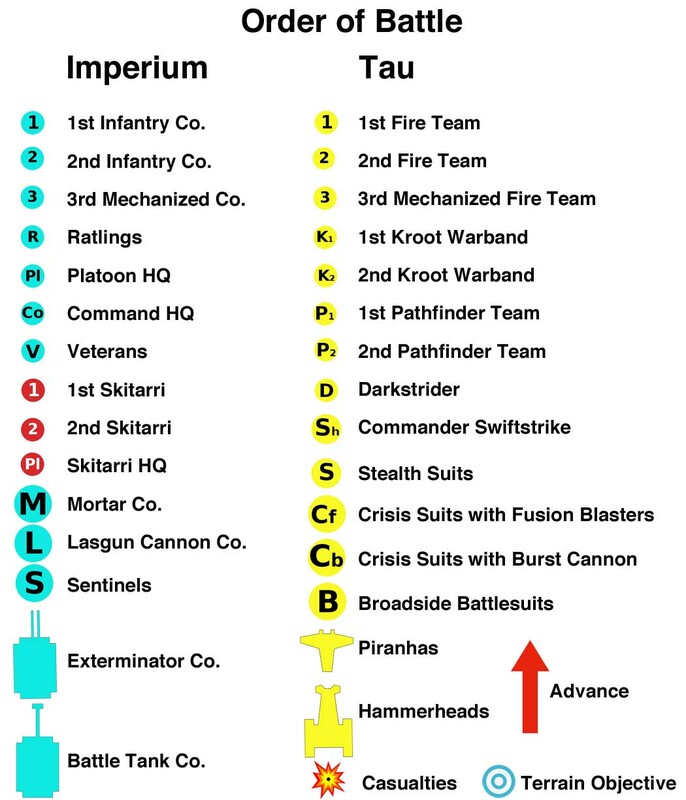 The vast majority of Tau were deployed on the right flank of the Imperials. The Tau commander intended for his skimmers and Stealth Suit contingent to rush forward and plant a homing beacon for an aerial assault with Crisis Suits. 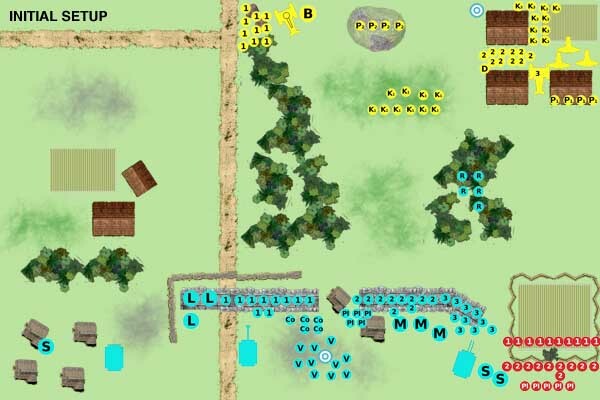 Foot-slogging infantry would run to within range of the Imperial infantry line and clear a path for the attack to pour through. The Imperial plan was much simpler: Kill the enemy with overwhelming firepower before they reached the Imperial lines. The battle began with a thunderous artillery barrage. Dozens of high-caliber rounds slammed into the Imperial trench lines, but the stout defenses offered welcome protection from the xeno fire. The only serious casualties reported was to a lasgun battalion deployed on the left flank, which covered the open landscape along the main highway that led to the port city. As the xeno artillery barraged ended, Imperial forces realized that the xenos would be advancing under cover of darkness. Despite the lack of visibility, the most likely points of advance had been previously targeted, and Imperial armor and artillery opened up on their pre-set coordinates. Key roads and clearings—the most likely routes of advance—quickly were scoured with heavy ordinance, and it had the desired effect. Auto cannon fire from the Sentinel platoon swept across the vanguard of the Tau advance, immobilizing their Devilfish and blocking the advance of the troops to the rear. Their reconnaissance mission complete, the Ratlings could have withdrawn to safety. But, spotting an advancing line of Kroot (xeno auxiliary troops of the Tau) the Ratlings prepared an ambush that proved highly successful, with more than 100 xenos—half the enemy detachment—killed. The survivors fell back more than 200 meters, their advance repulsed. On the far left Imperial flank, the one area where there was no sounds of xeno activity in the distance, Imperial leaders grew concerned. To determine whether this part of the line was truly unthreatened, a Sentinel platoon was ordered forward on a scouting mission. As the walkers nervously advanced through abandoned villages and empty farmland, they reported that nothing appeared to be moving. 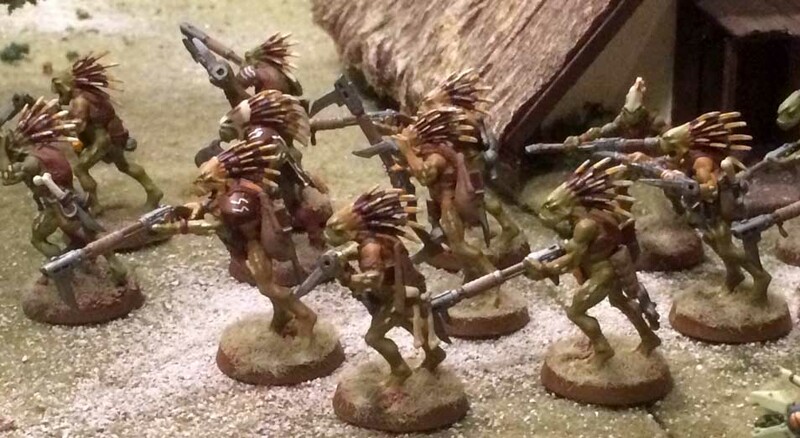 Kroot warriors, the Tau’s vicious xeno auxiliary troops, advance out of an Imperial farm village during the early morning hours. The attack had begun. But the Imperial fire had blocked the Tau advance, and while the xeno’s mechanized infantry attempted to clear a path forward, many foot-bound infantry scrambled over and around the vehicles in their rush to break into open ground. A squadron of Piranhas, however, managed to circumvent the confusion. Revving their turbines to maximum lift, the lighter craft rose over the low-built, earth-and-straw huts of the farm village and advanced, accompanied by jetpack-equipped Stealth Suits. The advance of the Stealth Suits was critical, as the squadron commander was equipped with a homing beacon to guide the aerial landing of two Crisis Suit Teams, led by Commander Swiftsword. The ambush of the Kroot on the vanguard’s right was the first warning that enemy forces were deployed outside the trench line, but Tau commanders responded quickly. Both Stealth Suits and Piranhas shifted their advance slightly so their weapons could be brought to bear. Meanwhile, a Kroot Shaper rallied his xeno brothers and led them back into the fight. Over the next hour, a savage and overwhelming fusillade engulfed the Ratlings—at the end, not a single abhuman survived the battle. While this more close-in fighting occurred, the heavy guns of the xenos—deployed to take advantage of a gap in the forest—fired round after round at the Imperial line. The darkness, as well as the Imperium’s strong defenses, largely defeated this bombardment. Only one round from a Broadside’s heavy rail rifle managed to target a company of Exterminator tanks, but the high-velocity rounds ricocheted harmlessly into the sky.